Handmade Local Cheese, Organic, Local Milk, Organic Butter, Kefir and Yoghurt! Please read the descriptions of the lovely cheese, natural yoghurt and organic milk and butter we have in stock and select which you would like from the drop down menu. All can be added to your veg box for free delivery when ordered by a Sunday evening, for delivery the following Wednesday or Thursday depending upon your area, or pop in and collect from our Farm Shop, Wednesday and Thursday 10am-5pm or Friday 11am-4.30pm. Each of the cheeses are individually priced. If you do have a particular favourite from the Northumberland Cheese Company, please contact us and we will do our best to order it in for you or why not try some lovely organic Birdoswald Cheese from Slack House Farm, Cumbria or Weardale Cheese! All cheese will come with a minimum 3-4 day shelf life but in most cases it is much longer than this (2-8 weeks). With all of the dairy products we deliver, they will be transported in a cool box but unfortunately we cannot leave this at the doorstep, so please provide your own cool box and cool blocks if you wish your dairy to remain chilled if you are not home. Unfortunately we cannot deliver dairy products alone, they must be purchased in conjunction with a veg box. Due to the artisan, small scale nature of the dairy producers we work with, please note, we may not hold stock of everything listed on our website all of the time. You will be notified after placing the order if something is unavailable. Christmas orders for cheeses must be placed no later than Sunday 25th November 2018. We cannot guarantee availability for orders placed after this time. Acorn Dairy. Organic. Local. Fresh Milk direct from the farm. The Paddock is delighted to be working with Acorn Dairies, Darlington to offer organic milk from their award winning herd of cattle grazed on the Yorkshire and Northumbria Dales from 23rd April 2017. Acorn Dairies was established by Gordon and Linda Tweddle with son Graham in 1998, pioneering the organic movement in the North of England. Daughter Caroline joined them in 2005, a real family run business, with organic principles and high levels of animal welfare at the heart of what they do. The milk can be delivered alongside your veg box or collected from our Farm Shop, Wednesday and Thursday 10am-5pm and Friday 11am-4.30pm. We do not offer delivery on the milk alone, it must be purchased alongside a veg box with a minimum spend of £12 - please see the FAQs section of our website for full info on our service. In keeping with our eco friendly ethics, we offer our milk in 1 pint glass bottles. No plastic! Please return the glass bottles, washed and unbroken to our shop and we will return 10p on every pint bottle which is returned. Unfortunately, at present, we can’t offer a refund on bottles returned at your doorstep on delivery but you are more than welcome to save your bottles until you can pop into the farm shop. Please return as many bottles as possible, whether it be to the shop for a refund or via the delivery service. We will collect all empties on your delivery the following week and return them to Acorn Dairies who will be most grateful! Please order your milk, butter or cream using the drop down list below, along with your veg box by a Sunday evening for delivery on the Wednesday or Thursday. 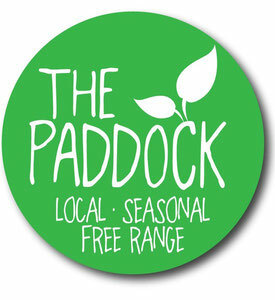 Alternatively, please email laura@thepaddock.org.uk if you wish to set up a standing order. Please be advised that the milk will be delivered in cool boxes but we will not be able to leave these for every customer. Milk will be left on the doorstep, please leave out your own cool box if you wish for it to be kept chilled throughout the day. All milk will come with at least 4 days use before from the day of delivery. Most of the milk will be produced on a Monday, arriving with us on a Tuesday, dated through to a week on Wednesday, giving you at least a week. All milk has 9 days from the date of production before best before. HOWEVER we may occasionally receive milk from the Friday production which will be dated through to the Sunday after you receive it. Acorn dairies can only guarantee 1 week use by date on their butter, as such, there may be times when your butter has a shelf life of 5-7 days but we aim to make this longer where possible. Studies have shown Organic Dairy is higher in essential omega 3 fatty acids and nutritionally better for you (not to mention the animals welfare!) - see the Soil Associations' Website for more info. We are delighted to find a local company producing handmade Kefir, a live probiotic drink, with local, organic milk. Teesdale Cheesemakers are producing Kefir from Acorn Dairies, organic milk in 500ml glass bottles with a metal cap (providing 3-4 servings). The kefir will come with between 5-7 days shelf life. Now available to order with your veg box for delivery for £3.75 per 500ml by selecting from the drop down menu below. Please return your bottles so they can be reused. What is Kefir and how may it help? "Kefir is a cultured, fermented milk drink, originally from the mountainous region that divides Asia and Europe. It is similar to yogurt – but a drink, with a tart, sour taste and a slight ‘fizz’. This is due to carbon dioxide – the end product of the fermentation process. The length of the fermentation time will affect the taste. Kefir is a good source of calcium and is rich in probiotic bacteria. Milk is a good source of protein and calcium, and kefir is no different. However it has the added benefits of probiotics. Probiotics are known as ‘friendly bacteria’ that can ease IBS symptoms such as bloating and digestive distress in some people and aid digestion." Slack House Farm is home of the Birdoswald Cheese Dairy and organic dairy herd. Eric and Dianne produce handmade, cloth bound, mould ripened cheese using unpasteurised organic milk from their organic dairy herd of Ayrshire Cattle. Situated on the edge of the Bewcastle Fells overlooking Hadrian's Wall, this handmade organic cheese is a real find. Produced using only vegetarian rennet, culture and sea salt, the cheese is suitable for vegetarians and can last for up to 4 months. The cheese is made using the original recipe brought to Ayrshire in Scotland, by Barbara Gilmour, from Ireland in 1688. Warm milk straight from the cow is hand-worked for up to 5 hours to produce a 20 lb cloth bound, mould ripened cheese that is matured for up to 6 months. The small herd of Ayrshire cows, feeding on clover rich pastures and hay meadows at Slack House, are ideal for reproducing the texture and flavour of this unique cheese. The farm is registered with the Soil Association, founded in 1946 by Lady Eve Balfour to promote healthy eating. Food must be produced according to strict standards of animal welfare, good husbandry and care of the environment. Prohibited is the use of genetically modified crops, chemicals, and fertilisers. All the land is farmed under Countryside Stewardship helping us to rebuild stone walls, restore hedgerows and ponds, plant trees and manage the land to support birds and wildlife in general. The cheese is pre-packed in various sizes, and priced accordingly per weight, with most wedges weighing between 150-250g. The cheese is £20 per KG, split into wedges. The website will not give you a final total for the cheese until it has been packed and weighed. We currently have Birdoswald original in stock. To add a piece of cheese to your order, please select from the drop down menu below. Eric and Dianne also produce a delicious organic natural yoghurt from their herd, available in 450g or 1kg tubs, the yoghurt is handmade and can come with anything between 3 days - 4 weeks best before depending upon the time of the month. The yoghurt can be added to your order using the drop down menu below, please contact us if you require a certain length of date on the yoghurt. North Doddington Farm is one of the few remaining family run dairy farms in Northumberland producing award winning, handmade artisan cheese and ice cream. The ice cream is available to collect from our farm shop, but unfortunately not available through the delivery service. The Fresian Holstein and Ayrshire cows graze happily along the Glendale Valley in the shadow of the Cheviot Hills. "The Doddington herd is made up of Fresian and Ayrshire crosses and currently we are breeding back to the traditional British Fresian. The milk is very suitable for cheese making and the cross breeding of our cows makes for much healthier stock with hybrid vigour. These cows are known as ‘dual purpose,’ that is to say they produce quality milk but are also suitable for beef production. Our cows graze outside in spring, summer and autumn, only to come into sheds full time at the onset of harsh winter weather, which is not that unusual for such a northerly latitude. Milked twice a day, their diet consists largely of grazed grass in the summer and home grown silage, fodder beet and cereals in winter." Berwick Edge - A robust and full flavoured gouda style cheese with undertones of pineapple and spice. Berwick Edge is similar to the trditional gouda cheese still made by the Dutch farmers in Holland today. Made with raw milk and traditional rennet, aged for 12 – 18 months to achieve it’s full and distinctive flavour. Cuddy’s cave is a close textured dales style cheese with undertones of citrus fruits. Mellow yet deceptively full flavoured with a lingeringly complex aftertaste. Made from our raw milk and traditional rennet, aged for 3-6 months. Doddington - Named after the village in Northumberland where the cheese is made.It is classed as a British territorial cheese, which lies somewhere between a Leicester and a cheddar. Exceptional flavours most notably sweet caramel and nutty characteristics, a cheese for true food lovers and cheese officianados. Unpasteurised, traditional rennet. Oak Smoked Cuddy's Cave - Smoked at the Teviot Smokery near Jedburgh. This cheese gets a 48 hour oak chip smoke, which slowly permeates in. The result is a succulent, smooth and creamy smoky cheese, devilishly addictive! Unpasteurised, traditional rennet. The cheese is pre-packed in various sizes, and priced accordingly per weight, with most wedges weighing between 150-250g. The cheese is £20.49 per KG, split into wedges. The website will not give you a final total for the cheese until it has been packed and weighed. We also have Doddington Dairy Cheese Biscuits available. A slightly sweet but savoury crunchy cheese biscuit flavoured with Doddington cheese. To this pumpkin and sunflower seeds are added for extra crunch, ideal for a quick snack or served with cheese. Please select the product you require from the drop down menu below. Not strictly local but we have a selection of organic cheese available from Lye Cross Farm, Redhill, Somerset - Organic Wensleydale in 245g blocks, available to add to your order using the drop down menu below. Weardale Cheese produces a range of hard, soft and semi-soft artisan cheeses, sourcing milk from local farms. Based in one of the old workshops at Harperley Prisoner of War Camp, Weardale Cheese occupies a truly unique location at the entrance to beautiful Weardale in Co. Durham. With 7 varieties available, there is sure to be something for everyone. Traditionally waxed, rather than wrapped in plastic, using local milk from local farms, small scale and artisan, Weardale cheese couldn't be more fitting with everything we believe here at The Paddock. Weardale: firm, white, naturally rinded dales style cheese..
St. Cuthbert: semi-soft, full flavoured blue cheese. Bonny Moor Hen: firm, smoked with cherry wood. Weardale Nettle: semi-firm, lightly herbed with dried nettle. Diablo: young, firm white cheese, mottled with smoked paprika and flecked with chilli flakes for a little kick. The cheeses are priced at £20 per KG and each wedge varies in size, but most cost between £3-£4. The website will not give you a final total for the cheese until it has been packed and weighed. The brie will have a much shorter shelf life than the others. Please select your flavour from the drop down menu at the bottom of the page. Handmade Local Cheese and Organic, Local Milk, Butter and Yoghurt! Handmade Northumberland Cheese from the Northumberland Cheese Company! The Northumberland Cheese Company have been producing handmade artisan cheese in South Northumberland since 1984. Based in a small dairy on the Blagdon estate, they hand make, wrap and sell a range of 16 farmhouse cheeses, all made with local cow's, sheeps and goats milk, fully traceable back the farms from which it is sourced. Here at The Paddock we are lucky enough to stock a small selection of these wonderful local cheeses. All of the cheeses come in 115g wedges, with a minimum shelf life of 3-4 days with most being much longer than this. A delicate mustiness on the nose leads to a rich buttery cheese with a refreshingly assertive flavour and a tongue-tingling saltiness on the palate. Cheese History: Cheviot was created following a demand from our customers for a strong, mature cheese to be added to our range. We took the basic Coquetdale recipe that was proving so popular with cheese lovers and instead of cellar ripening we put it in a bag and left it alone to mature. After a lot of trial and error and taste testing, we found the optimum maturity for this cheese was 6 months. The result was a strong vegetarian cheese, completely different in taste and texture to Coquetdale but one that has been a winning part of our range for almost 20 years now. Pasteurised Goat's Milk. Made with Vegetarian Rennet. A delicate take on the traditional goats' cheese with a firm texture, pleasant tang and a refreshingly clean finish. Pasteurised Jersey Cows' Milk. Made with Vegetarian Rennet. Handmade with Jersey milk and as rich and golden as autumn in Kielder Forest. A buttery, ripe and full flavoured young cheese with a lingering creamy aftertaste. Award Winning Cheese! Pasteurised Cows' Milk. Made with Vegetarian Rennet. All the creamy smoothness of our Northumberland Original combined with the subtle fresh flavour of real nettles. A true taste of the hills. Pasteurised Cows' Milk. Made with Vegetarian Rennet. Slowly oak-smoked over 24 hours to impart a full yet delicate flavour, which grows richer on the palate, with a smooth, long-lasting finish. A perfect balance between cheese and smoke. Award Winning Cheese! Pasteurised Cow's Milk. Made with Vegetarian Rennet. This mild handmade cheese is extremely versatile in the kitchen. Cool, silky texture bursts into a rich, buttery flavour with a satisfying finish. Melts super smoothly - perfect for sauces, on toast or as it comes. Based on a Gouda recipe. Pasteurised Sheep's Milk. Made with Vegetarian Rennet. A sweet, subtle sheep's cheese. With its rich, velvety texture, clean characteristic taste and refreshing tang this prize-winning recipe is one to savour. Award Winning Cheese! Or choose to enjoy any 4 115g wedges of Northumberland Cheese of your choice in The Cheese Lovers Gift Box, a perfect gift for that special occasion.